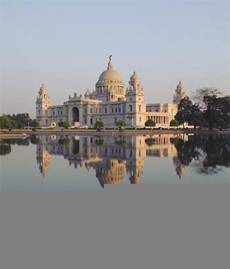 Day 02: Full day city tour of Kolkata. 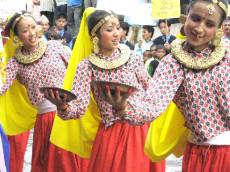 Day 03: Arrive Bagdogra by flight & drive to Darjeeling. Day 04: Early morning visit Tiger Hill. Afternoon tour of the city. Day 05: Morning toy train ride and later drive to Pemayangtse. Afternoon city tour. Day 06: Drive to Gangtok enroute visiting Rumtek Monastery. Day 08: Drive to Phuntsholing enroute visiting Kalimpong. Day 09: Drive to Thimpu. Day 10: Morning city tour of Thimpu. Drive to Wangduephodrang. Day 11: Day excursion to Punakha. Day 12: Drive to Paro enroute visiting Simtokha Dzong. Day 13: City tour of Paro. Day 14: Fly to Delhi. Day 15: Day at leisure. This former capital of the Raj still retains much of its colonial character. Its legacy lives on in the imperious Victoria Memorial in the heart of the city, today home to an impressive art collection, and the churches of St John and St Andrew. Stroll down to the bookstalls on College Street in the university quarter or sip coffee surrounded by the intelligentsia at the famous Indian Coffee House and you will quickly understand Calcutta`s long-standing reputation as a centre for learning and political philosophy. Elsewhere in the city, great swathes of cerise, pink and orange marigolds are bought and sold in the flower market. From here you can easily walk to the banks of the River Hugli for an excellent view of the Howrah Bridge, crossed each day by more than a million commuters. 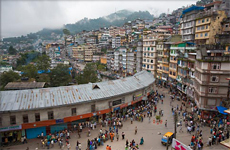 Set on a ridge at 1,547 metres, the Sikkimese capital Gangtok faces Kanchenjunga, a location that would justify a visit in itself. The nearby Rumtek Monastery was only built in the 1960s but is a replica of the far older building in Tibet which the resident `Black Hat` monks abandoned after the Chinese invasion. Whilst staying in Gangtok, it is well worth rising very early and driving to the viewpoint at Tashi to witness the sunrise over Kanchenjunga. Paro lies on the banks of the Paro Chhu in the centre of a broad valley - the only area in the country large enough to allow a plane to safely land. The fertile and productive soil has made the local population relatively wealthy, reflected in the standard of the local buildings, including probably the finest dzong in Bhutan. Reached by crossing a wooden bridge over the river, it was used on several occasions to defend the valley from Tibetan invasions. The former watch tower on the hill above now houses the National Museum with exhibits including a fascinating collection of pottery, armour, thangkas and a complete temple. 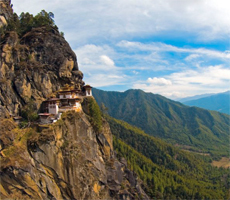 Outside the town, a trail through the forest brings you to Taktsang, the Tiger`s Nest monastery that clings to a sheer cliff - well worth the climb for the far-reaching views. 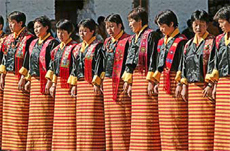 Bhumtang has an individuality that charms its visitors and separates it from other regions of Bhutan. 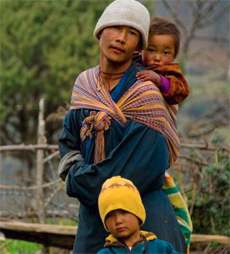 Comprising of four smaller valleys, the deeply spiritual region of Bhumtang is shrouded in religious legends. It is also the traditional home to the greatest Buddhist teacher Pema Lingpa, to whose descendants the present dynasty traces its ancestry. Phuntsoling is the Gateway to Bhutan Travel and is the commercial and industrial centre of Bhutan. This Mountain Kingdom is well known for its stamps and Phuntsoling is the Philatelic Centre of Bhutan. Established as the permanent capital of Bhutan in the 1950s, Thimpu has gradually grown over the last decade but remains a relatively small town dominated by the impressive Tashichoe Dzong. Buildings steeped in ritual and tradition encircle its vast courtyards and house the secretariat, king`s headquarters and the summer residence of the central monk body, while nearby lies the world`s highest golf course. A wander along the streets is recommended and reveals small shops stuffed with indispensable goods imported from China and India and religious paraphernalia, while the weekend market attracts people from miles around to bargain for everything from dried chillies and yak butter to hand-woven textiles. This is the last town on the highway before entering Central Bhutan. Sitting on top of a hill the formidable Dzong is the town`s most visible feature. 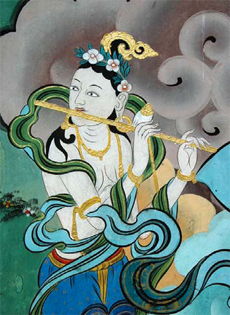 In the 17th century Wangdue played a critical role in unifying western, central and southern Bhutan. Just a tiny percentage of visitors to Bhutan make the long journey to Tashigang in the far east, crossing the 3,800 metre Thrumshing La and driving through villages clinging to steep hillsides. The bustling town was once the centre for trade with Tibet and is the principal market place for the semi-nomadic people of Merak and Sakteng who come to trade their yak butter for other provisions to take back to the mountains. The town is also home to the country`s only university while surrounding villages produce unique natural dyed textiles.